During rainy season, floods often occur creating unfavorable weather conditions for shrimp farming: temperature changes during a day and widespread thunderstorms making abrupt changes in water environment, causing shock in shrimps and possible disease outbreaks. • Water temperature drops suddenly. 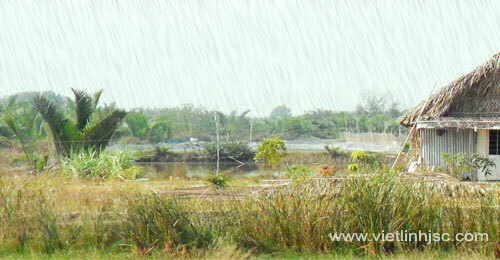 • Rainwater is acidic or leaches out alum from embankments into ponds, which makes pH in pond drops suddenly. • Rainwater and flood water can leach out alum, fertilizers, plant protection chemicals and toxic waste from fields, orchards or residential areas into rivers, canals and farming ponds. • Rising water level can overflow and destroy embankments. • Hurricanes, strong winds, big waves and flows can damage cages.